In some situations, you need the panorama feature in iOS 6 (iPhone 4S and 5 only). This feature lets you shoot up to 240 degrees and stitch together a high-resolution image of up to 28 megapixels. For example, in San Francisco, you want a picture of the magnificent span that is the Golden Gate Bridge. In the Himalayas, you want to record a visual memory of Mt. Everest. For posterity, you want that perfect image of your entire clan at a family reunion. Similar panorama features have been available on some point-and-shoot cameras and even rival smartphones. 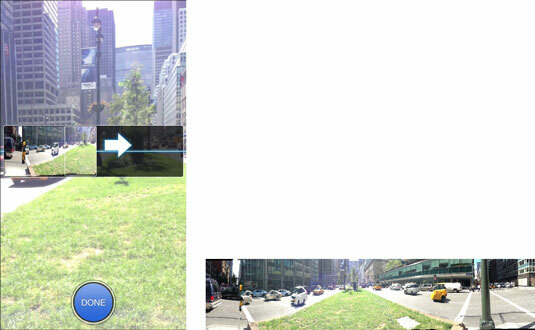 And it was possible to shoot panoramas on the iPhone 4 and 4S too via third-party apps. But now that the feature is baked into the Camera app, shooting panoramas is a veritable pleasure. Position the phone so that it’s at a proper starting point, and tap the Camera button when you’re ready. Steadily pan in the direction of the arrow, left. Tap the arrow if you prefer panning in the opposite direction. As you move methodically — if you go too fast, the iPhone will advise you to slow down — try and keep the arrow just above the horizontal line. When the task is complete, tap Done and admire your handiwork, right.